With so many online dating websites and apps available these days, it’s hard to know which way to go. All online matchmaking services today operate in different ways by either targeting a specific audience or by offering distinctive features and services. Each play by their own set of rules and EliteSingles is no exception. Standing as one of the most popular online dating services around, it caters to single working professionals looking for a serious commitment. 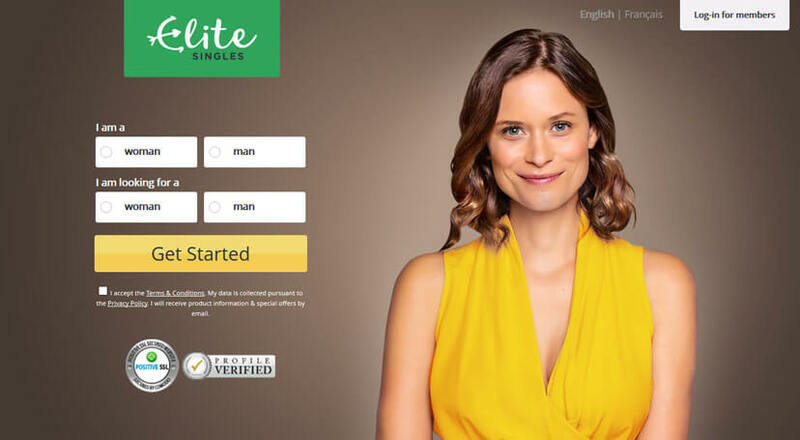 Using a specially-designed matchmaking algorithm, EliteSingles means business – and most importantly, it delivers fast results. But, is it the right dating platform for you? Find out in our EliteSingles review below. One of the first things to notice about EliteSingles is how fresh and current it feels. Boasting both a professional and an inviting approach to the concept of online dating, it is easy to see why it is one of the most popular online dating services working today. EliteSingles’ pride and joy is its carefully thought-out matchmaking process which comes in the form of an in-depth psychological questionnaire that is a requirement upon signing up. Covering five personality traits, including Openness, Conscientiousness, Extroversion, Agreeableness, and Neuroticism, the personality test is a lengthy one and it takes around 30-40 min to get through all of the questions before finally gaining access to your profile. Date Someone Really Cute – Try EliteSingles Now! As you scroll through the website, EliteSingles’ commitment and dedication are only highlighted further. Aside from offering tips on creating an attractive profile and a guide to online dating according to different regions, its Customer Service team is always at hand whilst the EliteSingles magazine offers a variety of articles related to dating and relationships. Strict safety and security measures are also put into practice every day to create a safe and secure environment for its members. EliteSingles say that they manually verify all profiles and remove those that do not pass the verification test. Sporting a clean and modern look, EliteSingles earns top marks in the design department. The functionality of the website results in a seemingly effortless and uncomplicated browsing experience with very little distractions and lags present to throw you off your game. User-friendly and easy to navigate your way around, EliteSingles boasts a pristine and calming color palette, which embodies lighter shades of grey and green, making the website all that more attractive to the eye. All of the features, which we will cover in more detail later in our EliteSingles review, are easily accessible and even those who are not too tech-savvy will be able to find what they need with ease. In addition to the beautifully-designed website, EliteSingles also offers a wide variety of fun features and tools needed to connect you to your potential matches. Once your profile is created, this is when all the fun begins. You are instantly sent a list of potential matches – EliteSingles promise at least 7 matches per day – which have been carefully selected for you according to the answers given in the questionnaire. They will be located in your Matches tab. There is also a ‘Have You Met?’ section where all additional matches are located for you to browse through. Unlike other dating sites, however, your profile-browsing abilities are limited and you can only look through the ones assigned to you. EliteSingles offers two kinds of membership, a basic (free) membership and a premium one. Of course, the basic membership is limited, but there are enough features for you to get a taste of how things work. With the free membership, you can take the mentioned personality test, create a profile, and see your daily matches (sadly, no pictures). In addition, you can send smiles to the ones you like and add them to your favorites, upload your photos, and receive messages. With the premium package, however, there are way more options to take advantage of. On top of everything else included in the basic membership, premium subscribers will also be able to download the result of their personality test and receive unlimited messaging for which they will receive confirmation of receipt. Additionally, they will be able to view all photos and modify their personality profile further as well as receive up to 20 different matches in the ‘Have You Met?’ section. The mobile app, available for both Android and iOS users, is also only available for premium subscribers who want to stay connected on the go. EliteSingles member base is vast and diverse in structure. Welcoming an average of 381,0000 new members each month hailing from all over North America, EliteSingles prides itself with helping 2,000 new couples each month find love. Open-minded and welcoming to all sexual preferences, its demographic finds that 90% of the members are between the ages of 30-55 and 85% have an above-average education under their belt. As is the case with most online dating websites, the gender statistics stand in favor of women – females amount to 56% of the member base. As a whole, EliteSingles serves as the perfect matchmaking choice for single professionals looking for long-term commitment. Easy-to-use and pretty to look at, EliteSingles boasts interesting features and offers a variety of services to help you during your search for love. On the downside, however, the registration process is long-winded and your free basic subscription won’t get you far. However, those willing to overlook these minor flaws will find a super-friendly and functional dating platform that is devoted to connecting like-minded and love-seeking professionals. I am eternally grateful for the EliteSingles team for guiding me through the process. I have been using the services for several months now and it didn’t take long to see the results. I have been on just a handful of dates before finally meeting the man of my dreams. Thank you, thank you, thank you! As someone who has never really had time to date, I am happy to find someone who can do the job for me. I have been using the EliteSingles app from the beginning and I am happy with the results. My only remark would be that some of my matches were a little bit far away from me, which didn’t really make things easy when trying to organize a date. But, overall I am happy with the service so far. It took a while for my profile to be verified and I was ‘on-hold’ for a few days. Also, my first batch of matches was a little bit far in the beginning. However, once I managed to get my account open and after contacting the customer care center, I was able to get back on track. Still waiting for that match though.